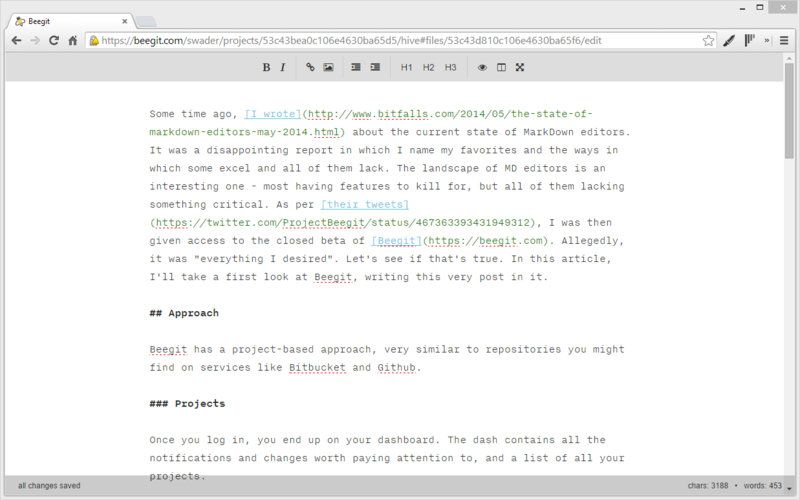 Some time ago, I wrote about the current state of MarkDown editors. It was a disappointing report in which I name my favorites and the ways in which some excel and all of them lack. The landscape of MD editors is an interesting one – most having features to kill for, but all of them lacking something critical. Some time later, StackEdit fixed their performance issues and climbed back to the top of my list, but still lacked some things. As per their tweets, I was then given access to the closed beta of Beegit. Allegedly, it was “everything I desired”. Let’s see if that’s true. 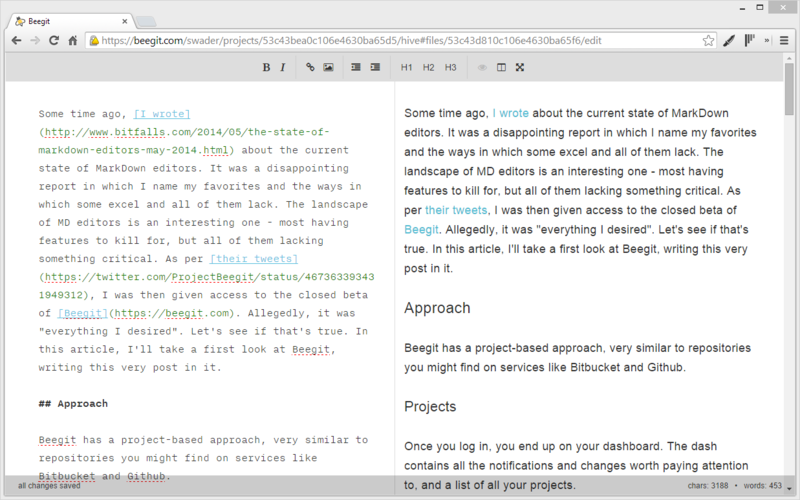 In this article, I’ll take a first look at Beegit, writing this very post in it (so meta!). Note that I’ll be comparing most features with the current reigning champion, StackEdit – in particular, their beta version. 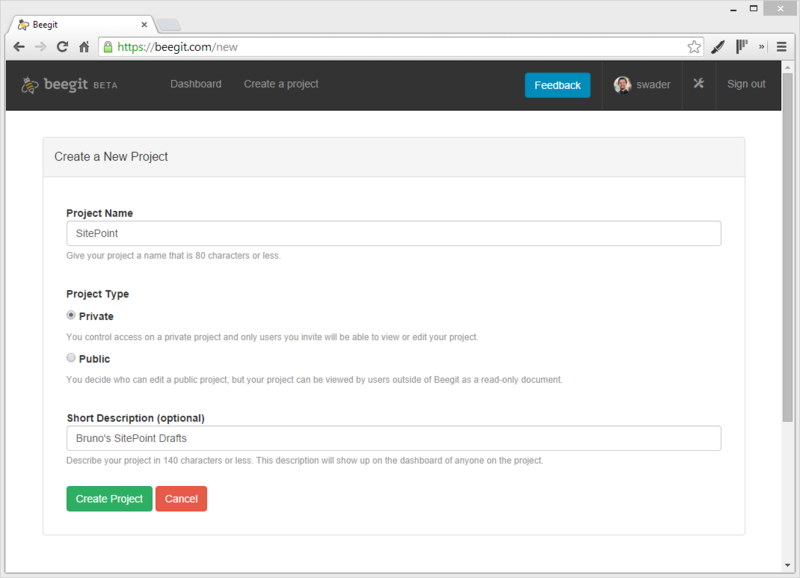 As opposed to StackEdit’s file-based approach, Beegit has a project-based approach, very similar to repositories you might find on services like Bitbucket and Github. Once you log in, you end up on your dashboard. The dash contains all the notifications and changes worth paying attention to, and a list of all your projects. Projects are like Github repositories. You can have public or private ones, and they all contain folders and other files. You can share them with other people, give them descriptions, rename them, change their cover image, and more. Additionally, you can switch them from private to public at will. However, this is also where I first encountered some problems. Files of long names get cropped, instead of wrapped. Sometimes, the toolbar and content fail to load. This requires a refresh of the page. Both problems can be seen in the GIF below. Let’s see how the UI stacks up now. All in all, compared to StackEdit, the UI is just as good, if not better. The toolbar offers a set of familiar buttons – bold, italic, indent, outdent, headings, image, link, and some non-formatting related buttons: preview, split screen toggle, and full screen. 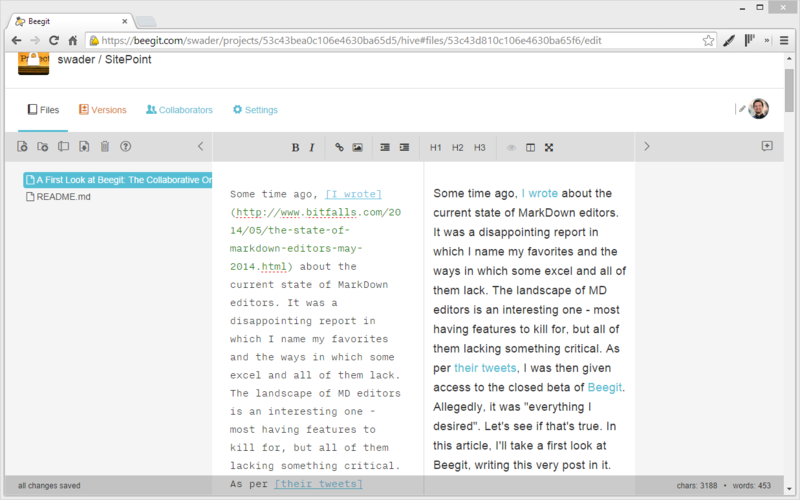 By default, the Beegit editor screen has a top area with navigation and options, a left bar with the project structure, a right area with collaboration comments, and the main area of the text editor. The full screen button removes all but the main area, and makes for a distraction-free writing experience. When writing in split screen mode (see below), the experience is even smoother. The Split Screen toggle switches the editor view from single-screen edit mode (Draftin-style) to two-column edit+preview mode, StackEdit style. The UI typically remembered the position of elements and frames when refreshing the screen or opening other files. However, when I entered another screen, like settings, and came back, the defaults were reloaded – for example, the right pane, which I explicitly closed, was opened again. This is a minor annoyance, but still an annoyance. Let’s talk about the internals now. Image embedding is a tricky one in this editor. While it does work adequately, it’s not as good as it should or could be. For one, you cannot upload images – there is no option to bind the editor to a CDN endpoint. The only thing the toolbar shortcut does is actually open a popup that lets you input alt text and the URL of the image, which is literally just a shortcut for writing the MD syntax. 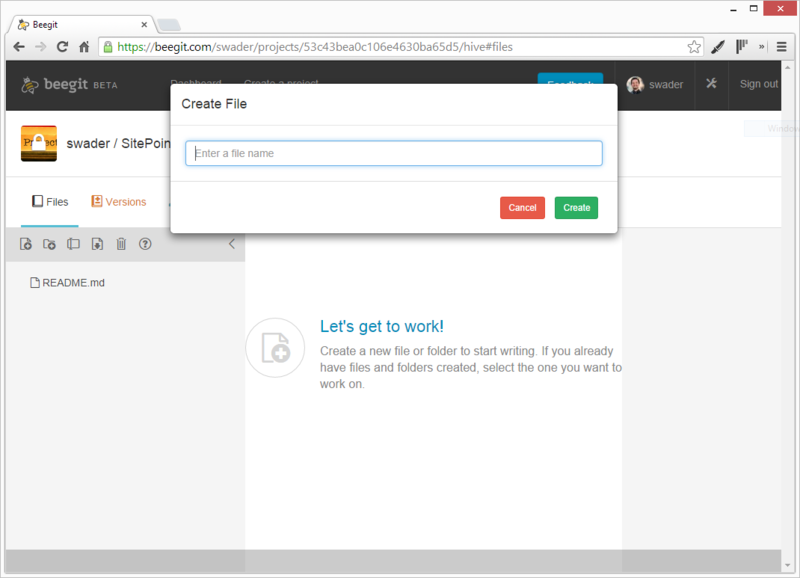 Writing a plugin that forwards uploads to a Google Drive or Dropbox is fairly simple, and should be done. The autosave is, as expected, automatic and works well – or so it seems. However, due to a launch overload bug on Beegit’s side, this is in fact the second time I’m writing this article, by reproducing it from memory. What happened was that the editor was reporting successful autosaves all the time, when in fact my changes never reached the server. After one of many successful refreshes, I ended up with an empty file, losing a 1000-word draft. They say this won’t happen again, but the fact of the matter is, the editor failed in one thing it should never fail in – data safety. A simple ping that checks an endpoint for a successful ping seems like an upgrade that could have prevented such a problem, or at the very least some local storage backups, though that might interfere with our next point. 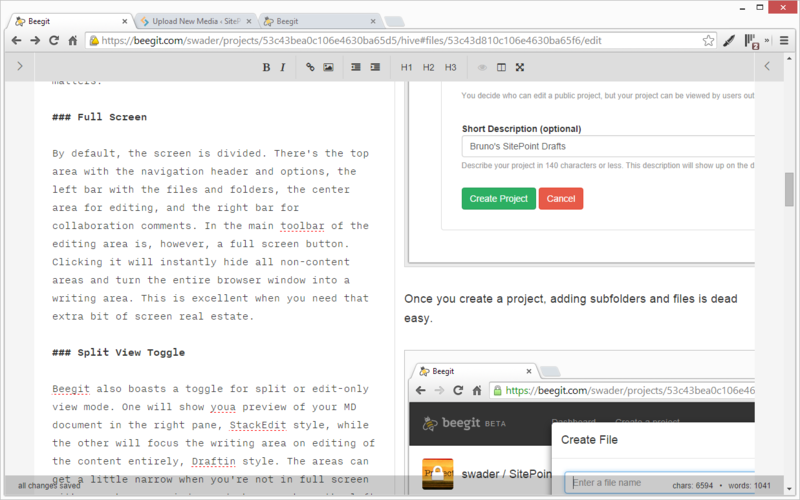 Beegit allows you to use multiple instances of its editor. This is important to me because I regularly edit different parts of a long article, or need to refer to older drafts when putting together or editing new ones. While it isn’t possible to ctrl+click on a file name to open it in a new tab, you can load it up in another tab from scratch and just get to the file from there. The problem with adding local storage for autosave safety (as mentioned above) might be some race conditions, so I’d rather implement a proper safety ping into the autosave than remove support for multiple instances. The spell checker is lightning fast, and checks your typing without delay. However, it’s not native (not your browser’s) which means you cannot change the language, and you cannot add new words to the dictionary. This is annoying, and the distracting red underlines on words like “isn’t” and “autosave” are just a nuisance. Even though the spell checker is both very fast and non-native, it still doesn’t do anything to hinder the typing speed. There is a very, very small delay that can be felt on keypresses, but it’s unnoticable unless you’re really used to a better speed (like in Draftin or StackEdit nowadays). 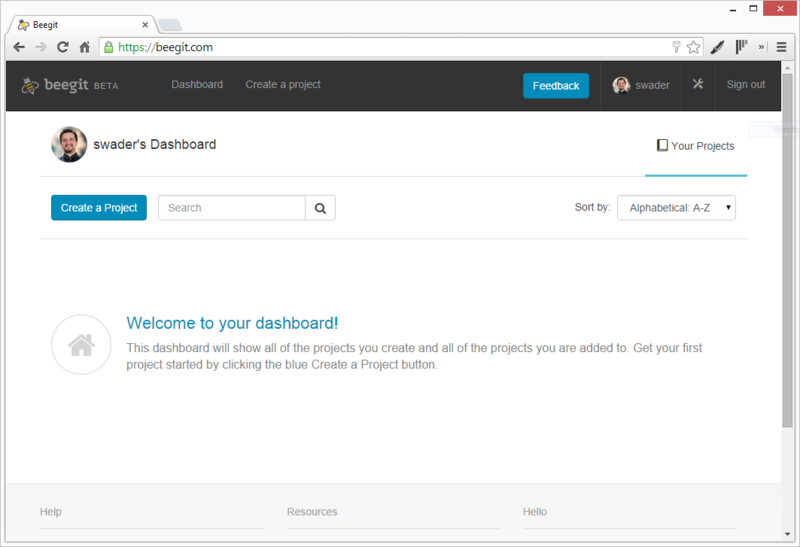 Unfortunately, Beegit has no plugin architecture whatsoever and cannot be tweaked to individual needs. This is a huge detriment – a tool needs to be tweakable to maintain a smooth workflow. Let’s test some collab features now. Collaboration will also put the other person(s) into read-only mode. I’m torn on whether that’s good or bad – I think it’s detrimental to work efficiency, especially considering it’s all versioned and can easily be processed, merged and fixed after the fact. When a comment is placed onto a document, it simply enters a comments column. There is no way to apply it to a certain bit of text (as in Google Docs) or to resolve it – it’s a one-dimensional conversation among all collaborators. Hardly collaborative, what with tools like Slack at our disposal. It’s handy to get an email when a comment is posted, but I can imagine it getting spammy when a real conversation heats up. Needless to say, the collaboration features won’t be winning any awards. When writing articles in MD or doing my daily edits, I need to use the HTML export button quite a lot. It goes without saying, then, that I rather dislike Beegit’s way of HTML exporting. Not only does it not allow me to edit my export type (for example, completely altering the export of code blocks, but leaving the export of the rest of the text as is), it also has no “quick” export – I need to literally download the HTML file, open it up, select the HTML, then copy and paste it into the back end of my choice (there is no publishing integration directly with popular publishing platforms either, so no hooking into WP, Ghost, Tumblr, etc). The export itself isn’t bad – it does its job – but it’s not what I’m looking for in terms of speed and use flow. I don’t want a file ever touching my hard drive – they should consider me a user on a Chromebook. I want the HTML to go directly into my clipboard, and I want to be able to tweak individual parts of that HTML that gets generated. Everything to do with code is definitely an area in which they should steal ideas from StackEdit. Beegit shows a lot of potential as the new kid on the block, but it has some serious downsides to turn around before being considered a serious contender. The awful code support, the lack of a plugin architecture, a non native spellchecker, and a rigid word counter are just icing on the cake of disappointment when I lost my draft an hour and a half into writing. Of course, the tool is still in beta and bugs are to be expected, so I’ll definitely keep my eye on it – but for now, StackEdit still reigns supreme. Have you given Beegit a go? What else do you think they should change?